The current share price is $28.00. The fund sponsor is Legg Mason Partners Fund Advisors, LLC. This closed end fund has 40 holdings in its portfolio. Top 5 stocks are Enterprise Products Partners, L.P., Energy Transfer Equity LP, Kinder Morgan Management, L.L.C., Magellan Midstream Partners L.P., and Plains All American Pipeline LP. Top 3 sectors are MLP (124%), general equity (2.18%), and short term debt (0.89%). You can buy this fund for your investment account through your stock broker, and online brokerage. 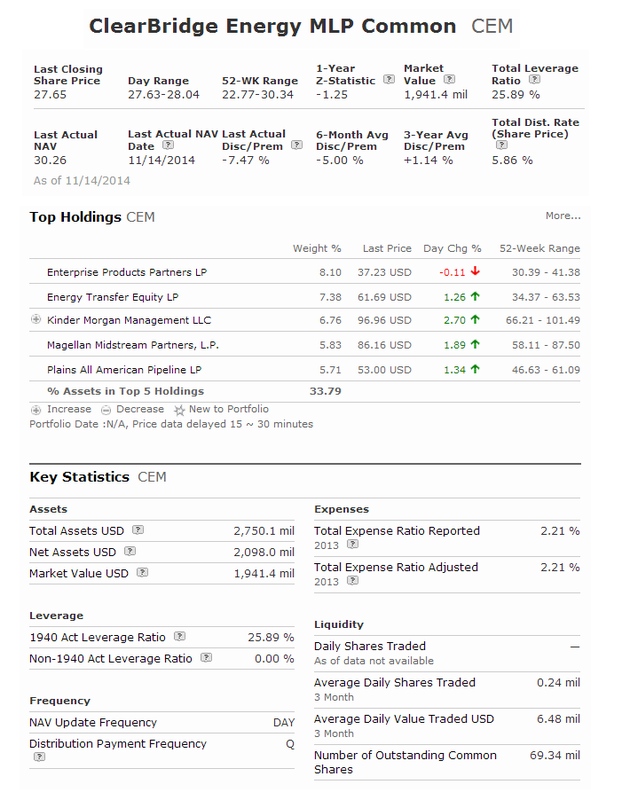 Some brokerages that you can use to purchase this CEF are TD Ameritrade, Schwab, eTrade, Merrill Lynch, etc. This ClearBridge Energy MLP Fund performance has been fine since 2010. This CEM Fund has a high expense fee.